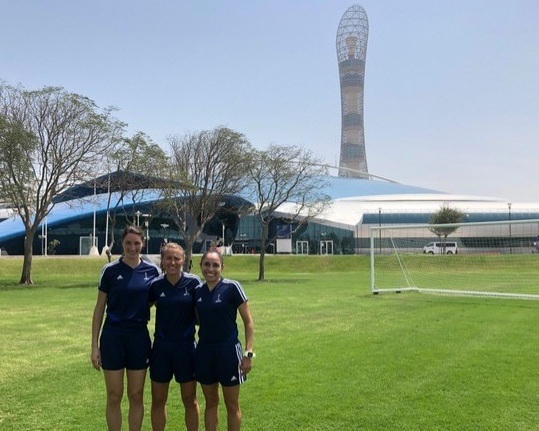 Katy Nesbitt, Katja Koroleva and Felisha Mariscal at the pre World Cup training seminar in Doha. With a full slate of matches PRO ARs had a busy weekend on Matchday #5. One slight unwanted trend was the number of errors made in the first 10 minutes of several games. These included two offside decision that were corrected by video review as well as a couple of boundary line decision. So, in addition to analyzing how to correct the offside errors, this week we want to review what activation techniques you can use to make you mentally prepared to start your match at full throttle. Preparing for a game starts during the week before your match by studying the teams, training, etc. but here we are going to discuss game day readiness. Rest, quiet and prep - Pack your game bag, layout your clothes, check you have all the items you need early in the afternoon and make a mental timeline of your departure. Planning allows you to eliminate the stress of last minute rushing. Check your line during the field inspection - Site lines, footing, imagine the game being played in front of you, what will it look like. This is a time for more than walking in a circle and a couple of pics. Locker room - Everyone has there own way of mentally focusing, but the locker room is yours. If there are people that shouldn’t be there, have them removed. If you need to sit by yourself, then do so. Routine is important. Pre-Game - Put down everything, stop doing anything other than focusing on the conversation. Study the rosters, understand what you expect will happen during the game, be clear that you and the referee are on the same page. Discuss players with the other AR, what are their habits, how they make runs, etc. Warm-up - At some point you must warm-up on your line. This is to get the “feel” of what you will be doing. Practice what you will be doing. Side step to sprint to goal line, etc. Checking the nets - you must make the run from midfield to checking the nets at least at 80% pace to re-activate your body. A light jog is not acceptable, it makes you look lazy and uninterested, a sprint says you’re ready to go and are ready to get it on. On your line - you must activate your body before the kick-off. This means take two to three short sprints or three jumps with knees to chest or some fast sidestepping from side to side. Do not ignore this. Game on - you have already mentally prepared yourself to work harder in this game than any previous game. Do it. At the time of the cross, the AR is square to the field and in line with the 2nd last opponent. This was good. The AR then turns with the play and doesn’t react to that same defender stepping forward. We already know this is a decision that we should get right on the field without VAR intervention. The AR knows it more so than anyone. How can we all learn from this and make sure we avoid it happening again. Listen to the audio, you can hear the AR say “Nima” (the referee’s name) at the moment the offside positioned attacker is kicking the ball past the goalkeeper. The AR was not sure who had headed the ball and felt that it was a defender. This could happen to any AR, even when in the correct position and square to the field as the ball had been headed in a group of several players. The AR needs to be more specific in the actual words spoken. By saying “Help, Help, Touch, Touch,” the referee will know exactly what you are asking about. The AR needs to say “Help, Help, Touch, Touch,” faster. We need to give the referee as much time to answer as possible to get the decision correct on the field. Proper procedure also requires for the AR to stand at the corner flag. This is clearly a VAR Delay scenario, so we should have time for a question, an answer, and a flag raised without the viewers thinking it was overly late. While the referee’s pregame provides an answer for many situations, this should be clear. If an assistant referee asks for help, there needs to be a response. The referee’s replies (in that moment) can vary from “GO GO GO” to “TOUCH” to “OFFSIDE” to “DEFENDER” to “DELIBERATE” to “DEFLECTION” to “PLAY” to “GOAL”. Ultimately the AR can process whatever comes out of the referee’s mouth, but silence will just increase doubt. When you listen to the audio after the goal is scored, you can hear that the AR was aware of the offside positioned attacker, but rather had a doubt over who played the ball forward. Correctly, because he had Doubt = flag down. Thankfully the VAR fixes this without breaking a sweat. To conclude, we clearly don’t want any PRO AR demonstrating the issues mentioned at the beginning. Yet when we look past those, we can learn that better communication via the radio might have gotten him out of trouble. Hopefully that is a good take away for everyone. With the game still scoreless during the early stages, a goal was scored through a deflected shot by TFC's Justin Morrow. Previous to that, TFC's Nick DeLeon was in an offside position when the ball was played to him by Marky Delgado. The AR in this case was in excellent position at the time of the pass and DeLeon was ahead of him and slightly to his right. There is some difficulty to this decision because the pass is coming from the left and the second to last defender is near the center of the field. Trust your instincts here. If you know you are spot on with your position when the pass is made, anyone to your right will be in offside position. If your work rate is high and at the level of the movement of the defenders you know you will be where you need to be and can make this decision. Trust your body and your position. New England v Minnesota produced two delayed offside situation that puts the AR to the test. The first one is at mid-field and creates a breakaway. The second one involves what could be a collision on a 50/50 ball. In both instances the AR raised the flag without delay. Was this correct? This is not a delayed flag situation because of the distance and the size of the offside position. When looking at it from an imminent goal scoring opportunity we do have “headed directly toward goal”, but that is it. He is not entering the penalty area, in fact he has a good 40 yards to go. His Time is not that clear, because of the distance to goal and defender in pursuit. Finally, the offside position is clear enough that a flag is correct in this incident. Nothing like a possible collision between an attacker and the keeper to put the assistant referee in a difficult position. Flag up and stop this or delay and give the attacker the opportunity to possibly complete this imminent goal scoring chance? This flag should be delayed, the offside is close (and correct), the attacker is headed towards goal and should he get to the ball first, will have a good look at goal. Additionally, this ball is on the ground so control is more likely. An aerial challenge in this same position a flag would be expected. Frank Anderson steps up in Week #5 with Portland’s very nice team work goal in Los Angeles. The right shoulder of the defender is ahead of the attacker making this a very close, but correct offside decision. Brian Poeschel was busy with his delayed offside incidents mentioned above, but no delay was needed on this decision with a well timed run by the attacker that sets up a New England goal. Who had Call of the Week #5?